This outdoor work from Folgers coffee has been making the rounds on the ad blogs in the past week; now the New York Post adds some more info. 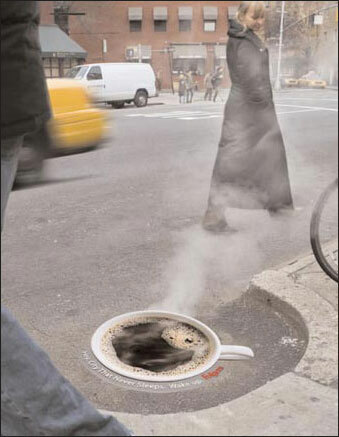 Saatchi & Saatchi dressed up some New York City manhole covers to look like steaming cups of coffee. But according to the Post, the ads have the right look, but they don’t have the right smell. The “unjava-like aroma wafting through the steam holes” smells like the sewer from which it emanates, the Post gently points out. Doesn’t exactly stimulate the senses in the right way. Makes me yearn for the days when I lived in Hoboken, where the Maxwell House coffee factory, adorned with a three-story neon coffee cup, would blanket the city with the aroma of roasted coffee beans all day long. Sometimes it smelled just like fresh-brewed coffee; other times it reminded me more of burning rubber. Maybe Folgers could hand out free samples by their ads, along with noseplugs.